New features in Version 2: Faster analysis (up to 50% faster depending on CPU power) and improvements to the algorithm and workflow. There is also now a companion Drumatom Player plugin (sold separately) that allows you to reduce bleed from inside your DAW. 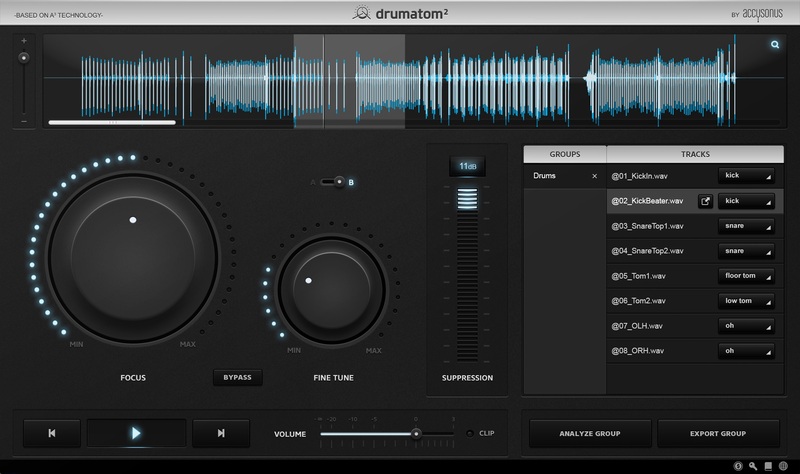 Drumatom is a stand-alone MAC & PC application every sound engineer can use to mix drums like never before. Boost highs on the snare channel without introducing harsh hi-hat crosstalk. Add reverb on rim shots, mix hot and panned toms without phase shifting or adding harshness to the cymbals. 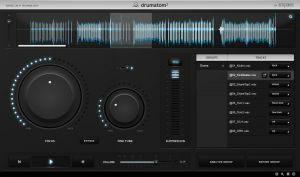 Don't be surprised if, after using drumatom on a drum mix, you want to go back and use it on all your mixes. The companion drumatom player plugin (sold separately) allows you to control the bleed of your analyzed drumatom tracks from within your DAW, providing a whole new level of control during mixdown. Reduces cross-microphone bleed on recorded drum tracks without altering the tone of the source. Reduces microphone bleed throughout the duration of the drum hit — from attack to tail. Focus and Fine Tune controls make dialing in just the right amount of bleed reduction easy. Flexible and easy copy/paste of drum tracks between analysis groups. Import tracks from a .dls (drumatom group file) directly into a new session. Filters out bleed based on tonal content, not amplitude. Auto matching of algorithms to track names, kick to tracks named "kick", snare to tracks named "snare" etc. Suppression meter displays the level of reduction in dB. Waveform display shows processed sound (white) overlaid with original (blue). Optional plugin player allows you to control the amount of bleed from within the DAW while mixing (sold separately).